These works were made during a period of personal upheaval, both positive and negative; both prologue and aftermath. Their ambiguity corresponds to the inability - the futility - of describing that period and the mental state that produced and informed the nature of the work where everything, every relation, seemed uncertain, symbolic of something that could not be named. These works do not seek to narrate. If anything they suggest oblique interpretation, a resistance to linear narrative, yet there is the attempt to construct some kind of order, a nominal unity from personal disorder. It's easy: you require an internet-connected device only. You connect to that page, those pages: a grid of bodies, body parts, and obscured and blurred faces. Another page: methylamphetamine, medicinalkush, OxyContin offered or wanted. Maybe you simply want to buy a handgun? Want to share your partner with another man, woman or transgender? If you want to play you bring the puff, the meth, the cold, the ice; only got juice or Gina? Are you willing to pay for those bodies, the gear? Or maybe you are offering your body’s services: two pineapples. What’s your kink? You know the lingua franca, the MO, yet all you have is a small residue of 420 in a cigarette filter ziplock next to your handset. But you have Wickr, you have Kik: no fakes, no ping pong, no timewasters, be real, DDF, DTF, NSA. What's the price of your loneliness, your fantasy, your low? There are virtual arrangements and non-virtual addresses. There are streets and places, routes and cul-de-sacs. You have A New Low in getting High in your iPhone's buds. You're getting to know what you can't enter: "this is where we're going, this is where we're heading." Yet you don't know where you're going. You don't know what you're going to find. But is not every spot of our cities the scene of a crime? every passerby a perpetrator? Does not the photographer - descendent of augurers and haruspices - uncover guilt in his pictures? A rebus: a catalogue of sites and/or a catalogue of latencies, signs, but of what? The sites, which range from former scenes of forced prostitution, suicide, murder, drug manufacture, assault, and armed robbery are interleaved with sites equally as banal. The sites posit no narratives; there are no common codes, signs, yet they intermingle as images amongst one another, sub rosa. Like a location scout with scrambled addresses, the images seek to cancel one another, the sites and their signs become suspicious of themselves and their portrayals. The tarantula, the adder, and the asp will also never change. Pain and death will always be the same. But under the pavements trembling like a pulse, under the buildings trembling like a cry, under the waste of time, under the hoof of the beast above the broken bones of cities, there will be something growing like a flower, something bursting from the earth again, forever deathless, faithful, coming into life again like April. Between 1930 and 1935 Sodeman murdered four girls between the ages of 6 and 16 in suburban Melbourne and rural Victoria. You Can’t Go Home Again attempts to trace the archaeology of murders associated with Arnold Sodeman. Yet Sodeman, a labourer with a young family, was typical - as were the families of his victims - of many unskilled Australians of The Depression Era: scarce finances and highly limited or transient employment opportunities, if any. Sodeman’s lodgings changed frequently; seeking any available work, Sodeman’s family moved between suburb, town and township, as do the series’ images. These samples from You Can’t Go Home Again offer an overview of the project’s larger means: the documentation of relevant sites (many demolished); the use (and editing/alteration) of primary source archival material, and the interpretive between: the space between the fictive and factual. While the series shifts between private and public memory, it interlaces with my own history: I grew up on these same streets, unaware of their stories, their tragic histories. Condello had been sleeping only a few hours at a time for the past couple of months and was changing locations almost daily, never giving the assassins on his trail a chance to lock on to his routine. In the underworld it’s called sleeping in the trees, the target keeping an eye on the below. The idea is catch the would-be killers in the act of stalking you, to creep up on them as they sneak up on you. 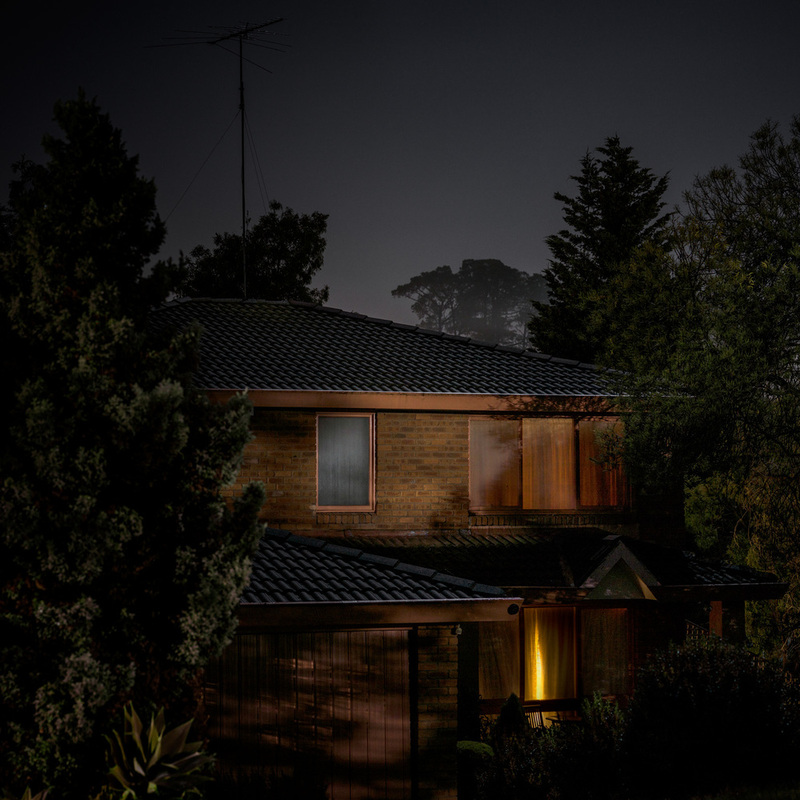 Sleeping in the Trees catalogues the execution sites, getaway routes, surveillance areas and zones of Melbourne's Gangland War. The sites themselves reveal nothing of the acts enacted at - or within - them; each structure, street or landscape remains indifferent, unable to suggest or divulge any account of the site's violence. While these sites provide a kind of banal suburban phenomenology, there is a witnessing, a latency of the the crimes that is never fully sublimated. Middle-class suburbia - affluent suburbs such as Aberfeldie, Armadale, Chadstone, Brighton East, South Yarra and Templestowe, sites which are not stereotypically ascribed to gangland killings - represents the work's core; unmoored from events, they appear to consolidate - deceptively - the truism of safe as houses. The images within the series do not merely ‘document’ (documentation is only a partial pretext) each of the 25 sites of the victims of the period. The images were taken within the same nocturnal space as the events, typically at the same time as the murders themselves: 21 of the 27 victims were shot at night. Equally, night is as much the pretext of the project as its context. Remembered houses and streets of a suburban childhood, formaldehyded in memory and time: the primary act of photography’s orthodoxy. Without their histories, stories and occupancies these houses become autonomous as objects, not homes. Nor do they reveal a child’s irrational fear of certain houses - of darkness itself - but a kind of overcoming. Denuded of cars or artefacts that suggest their space in time, these facades and edifices become palimpsests for memory’s incisions and distortions.